What a lovely piece on Amanda Maier! I first heard her music in 1994 when the violin sonata was released after some research. 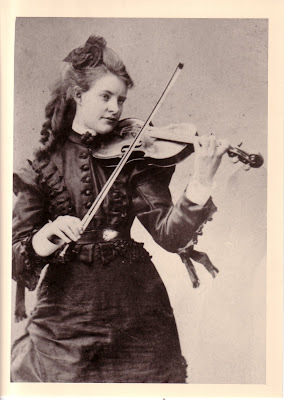 The musicologist could tell stories of Brahms much enjoying her cookies she presented at her many musical gatherings, as well as his appreciation of her music. They played some of her music together. Anyway, she really is unjustly neglected; but after all, she was a woman, so what else can one say? I went to Amanda's native town and found more photographs of her. They are owned by the city museum. In the photo of your post, she apparently is 20 years of age. I'd like to upload a photo somewhere and perhaps show you a picture of her standing, vith violin in hand, behind a woman sitting by a small organ. Perhaps you'd know who her organ-friend would be? Please put a link to the photos when you upload them! You are so lucky to be able to act as a "scout" for information about her. I do know that she was friends with Ethel Smyth who was a fellow student in Leipzig (Amanda is mentioned briefly in Smyth's memoir). Smyth has a very recognizable face. This is all very exciting, isn't it? Yes it is exciting! I didn't know Amanda was friends with Smyth. I wonder if she adopted Smyth's political views and feminist work. Better get hold of that memoir of Smyth's somehow. I'll tell my friend Fredrik (who showed me your blog post on Amanda Maier) to look for it. He's got probably EVERYTHING on Virginia Woolf, and because Smyth fell in love with Woolf, he probably has something from Smyth as well. Anyway, my job will be to upload a few photos of Amanda since I don't live too far from her home town. There are a couple of photos of her as a little girl, and one at adolescence, and a few more of her posing with her violin. I'll let you know. "There was one more belonging to that household, a dear Swedish girl called Amanda Meyer, violinist and composer, who afterwards married Julius; and then for the first time I saw a charming blend of art and courtship very common in those days. Thus it must have been in Bach's time, thus with the old Rontgens, but I don't see how it can come off quite in the same way under modern conditions." I imagine that Maier was socially a product of her time, while Smyth was ultra-progressive. Perhaps an unabridged version has more! Hello! I got Fredrik's wife to wire these from the library. After all, she's a librarian! These photos were all picked up at the city museum in the town where Amanda lived. Some of them we've seen before; for example the wikipedia photo which probably was scanned from a cd booklet or some paper scrap. The name Selma printed on a couple of the photos refer to the photographer who lived in the same town. Greetings! And I'm sure Amanda would send you hers as well! Thank you Andre. Once my heart stops pounding, I'll try to put them in some plausible order and put them in a new post. Interesting post. It was nice of you to share this piece of history. I actually already know your excellent recording! Danny Morganstern told me about it. I just got a hold of Amanda Maiers six pieces for violin and piano. I hope to record it soon! After you record it, perhaps you could make the score, which I imagine is firmly in the public domain, available through the Petrucci Library! I just heard her Violin Sonata and love it! It is wonderful! Who plays it on Youtube? Thank you for writing about Amanda Maier!